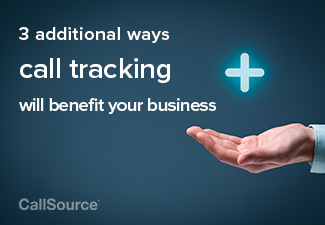 Call tracking can obviously help you make better marketing decisions—but what are some secondary aspects that it’ll help your business improve upon as well? We’ve already touched upon how call tracking is beneficial for your business and even helped one of our clients save over $45,000, but what are some residual benefits that you will achieve by utilizing a call tracking service? There is a lot more to it than the reasons that you may have initially signed up for. Before implementing call tracking, you as business owners and managers were probably running around putting out (hopefully figurative) fires for the business and some days only able to focus on the problem(s) at hand. Not that those will magically all go away as soon as you implement call tracking, but now you can easily see what your problem areas are and focus your time where you really need to, so you can start planning ahead. Reports are delivered via email so as soon as you come in every morning; you know what you need to work on. Your dedicated CallSource advisor has additional resources for you as well such as webinars and other leadership documents on how to use CallSource to help with team management and other business skills. We know that creating and keeping a good internal team culture takes effort, and doesn’t just come easy. By utilizing call tracking to set goals for your employees, you should be sure to share goals and progress updates, getting your team more involved in their job and how it not only affects them, but the company. This will get them excited to start working not only on their individual progress, but how they work together as a team. Call tracking makes it easy to create incentive plans to meet company goals and personal achievement goals while increasing in their camaraderie. Use your CallSource call tracking reports during team meetings to inspire and encourage employees to do their best and work well with each other. With call tracking, there is no more guessing. Instead of thinking that a certain employee is your best call handler, you can now put numbers to your assumptions. When call handlers know their performance will be followed up on, they will work harder to do the best they possibly can. Accountability fosters a team environment to hit bench marks. Third-party metrics validates employee achievements. It’s a way to define goals and create benchmarks to support business goals. When uncertainty is removed, employees perform better and a positive culture is reinforced. What does your company need help with? What questions do you have that we can answer? Drop us a comment below and let us know what topics you want to hear about! We can’t wait to help you improve.